The harness is worn by the swimmer so that the front lifting strap passes across the stomach and between the legs. The lifting strap places the point of attachment to the swimmer much lower on the body than the equivalent waist attachment point on similar stationary swimming devices. This, combined with the angle of restraint formed by the anchor rope, as a result of the attachment point, converts a significant percentage of the resisted forward force into a lifting force, helping to support the weight of the lower part of the swimmer`s body and legs. It comes with a 2 yard bungee that is connected to 4 yard anchor rope that can be added to if necessary. It should be secured to an immovable object such as a fence or a tree. It fits most sizes. Would you like a way to improve your swimming ability to relieve pain, promote weight loss and generally feel fitter and healthier? Swimming is a healthy, low-impact form of exercise that gives your whole body a work out because you move against the resistance of the water while you swim. At last an easy way to improve your swimming in your own pool. 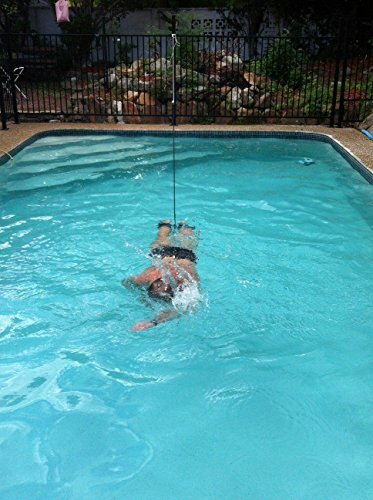 With the StillSwim Stationary Swim Tether/ Belt you can swim for longer and get fit faster. The perfect solution for getting a great work out. You`ll be at home, so there is no travel time, no cost of membership fees or entry fees and no other swimmers in your way. Add it to the relaxation, family and social benefits that you`re already getting from your pool. For anyone who wants a nonstop swim, to athletes who want a training work out. The innovative design supplies buoyancy to the lower body. An excellent option for busy people because it allows you to exercise at home, at your own convenience. If you have any questions about this product by Stillswim, contact us by completing and submitting the form below. If you are looking for a specif part number, please include it with your message.